GET A 3rd ONE of equal or lesser value FOR FREE!!! Offer valid while supplies last. Very limited quantity on some items. (*) For Preferred Customers, your 10% Preferred Customer Discount ALSO applies to this Offer!!! Brsdm. Fly Away 'Miami' HCC/AOS from $16. Burr. Pacific Command from $19. Grcym. Lovely Melody @ $11. Wils. 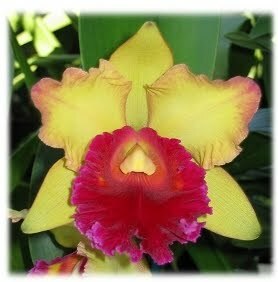 Hot Spot 'Exotic Profusion' @ $16. You can subscribe to future BUY 2 GET 1 FREE CLEARANCE SALE posts through RSS, Twitter, and Mailing List. Please check back often to make sure you don't miss out on any great plants and deals!!! We will be adding more items as we sort through our plants. Get them now and watch them spike this coming fall/winter. Backbulb divisions with new growth. In 4.25" pots - Reg. @ $11. This is the species on which the Phalaenopsis genus was founded. It is also one of the species that is the basis for most of the modern white hybrids. In 3" pots - 6"-8" Leaf Span. Reg. Price @ $11. Vigorous grower and profuse bloomer. Warm growing, easy to grow and bloom in this area. Numerous, good size, burnt orange-colored flowers are borne on heavily branching tall spikes. A real show stopper and impressive plant for gift or home/office decoration. Large, Mature Blooming Size plants with new growth(s). When these last bloomed, they all had multiple flower spikes!!! In 5.5" pots. Reg. Price @ $19. In 6" pots. Reg. Price @ $22. In 7" pots. Reg. Price @ $24. In 4.50" pots - Reg. @ $16. In 6.00" pots - Reg. @ $19. An easy to grow and bloom plant that produces dozens of carmine red flowers on arching, branching spike. In 5.50" pots - Reg. @ $16.